How will Obamacare affect my Medicare supplemental coverage? Home > Blog > How will Obamacare affect my Medicare supplemental coverage? So you want to know how Obamacare will affect your Medicare supplemental coverage? Here is the good news. Medicare is not part of the health insurance exchange. That means your Medigap | Medicare Supplement will operate and perform just as it did last year. Your Medigap PLAN will continue like it has in the past with the same benefits described in the Outline of Coverage. Medicare Advantage with Part D (MAPD) plans may or may not lose some benefits this year depending on the insurance company. What if you only have Medicare Parts A and B? You are not required to purchase additional insurance (Medigap or MAPD) although it is highly recommended that you do. Parts A and B are not comprehensive enough if you were to get sick, injured, or have health issues. The way in which you purchase your Medigap Insurance will not change either. If you are not in open enrollment or a guaranteed issue situation, you are still subject to medical underwriting. So what if you want to change plans or switch to a new insurance company? You must answer the insurance company’s health questions to qualify. Medicare now covers certain preventative services, like mammograms, colonoscopies and diabetes screenings without charging you for the Part B coinsurance or deductible. Annual wellness visits are also provided at no additional cost to you. People with Medicare Part D now receive discounts on prescription drugs while in the doughnut hole. The discount is applied automatically at the pharmacy. The Affordable Care Act (Obamacare) is in place to help protect the solvency of Medicare. Obamacare is attempting to accomplish this by providing resources to reduce waste, fraud, abuse and Medicare costs. This law adds a 12 year extension to the life of the Medicare Trust fund. Now for the bad news. Obamacare will be implementing budget cuts to the Medicare program. 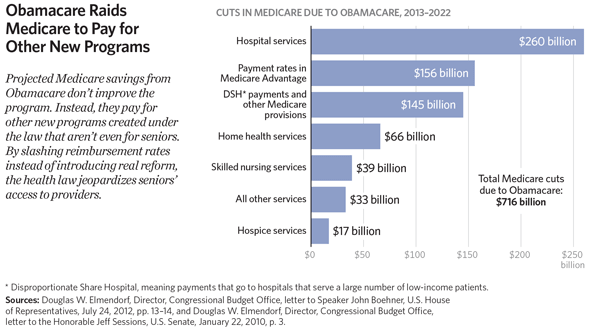 The graphic below is a description of these cuts to the Medicare program. Unfortunately, we will have to wait and see how these cuts will actually be made. We must also wait to see how Medicare beneficiaries will ultimately be affected by the cuts. For the time being, your Medigap | Medicare Supplement coverage benefits will not change.